During your sleep, breathing pauses temporarily when you have sleep apnea. It can last from a few seconds to a few minutes. More often than not, the condition is undiagnosed as most people consider it as pretty normal. In the rest of this post, we will explore some of the main causes of sleep apnea, which will help you to be provided of a better understanding of this condition. In adults, being overweight is one of the factors that could increase the risk of sleep apnea. When you are obese, extra level of fat in the neck and this is one of the reasons why you can have difficulty breathing. It can be an obstruction in the airways and will limit the amount of oxygen traveling. In addition, taking a look at statistical data, it can also be concluded that people who are overweight are two times more likely to suffer from sleep apnea when compared to those who have normal weight. There are several forms of throat infections, such as an enlarged tonsil, which can be a significant cause of sleep apnea. The adenoids and the tonsils are two of the most important parts of the throat and they form the airway. With the enlargement of the two, the immediate effect is that the amount of air that flows into the lung will be restricted. They may not cause significant problems when one is awake, but upon sleeping, when the muscles are relaxed and the pressure is low, this could lead into sleep apnea. Accept it or not, aging will have an impact in your life in more ways than one. Among others, it can be one of the most common of sleep apnea. The physical changes that are experienced by the body when you age can make sleeping more difficult, and for this reason, the risk of sleep apnea can be higher. In one study that has been conducted by Edward Bixler and colleagues in 2008, which was published in American Journal of Respiratory and Critical Care Medicine, it has been concluded that age is correlated to increased risk of sleep apnea. Many may not know it, but your sleeping position can be a cause of sleep apnea. It is important to sleep in the right position not only for your highest level of comfort, but also to keep your airways open. Back sleeping is one thing that you should avoid at all costs. The best would be side sleeping. This can effectively keep the airways open. There is a strong body of research supporting the claims that sleep apnea can be hereditary. In one study that has been published in Sleep Medicine Review, researchers were able to collate evidences from various sources to prove that genetics can indeed play a significant role in sleep apnea. Familial factors can have an effect not only on the presence of such sleep disorder, but also on its degree of severity. 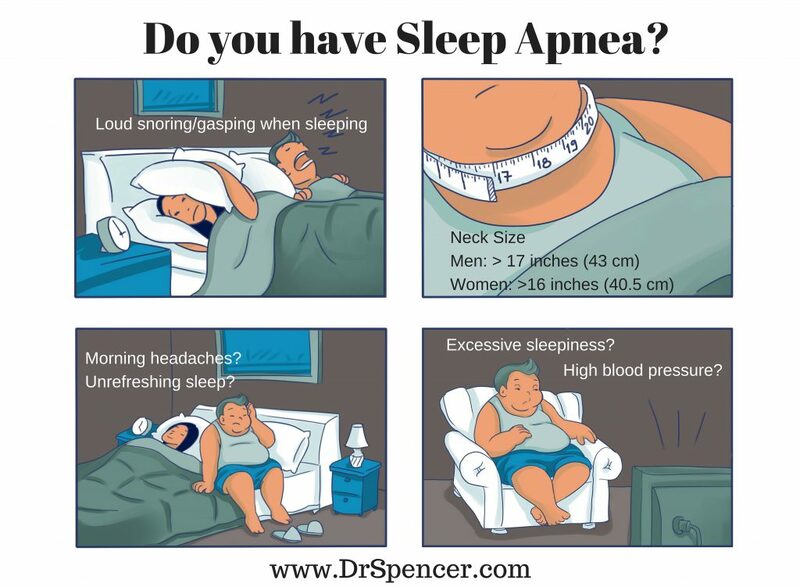 Many sleeping problems, including sleep apnea, can be caused by your lifestyle. For instance, if you are smoking or drinking alcohol, you will be at higher risk. The same thing is true if you are taking medications, specifically those with sedating effects. To lessen the likelihood of suffering from sleep apnea, you must live a healthy lifestyle to prevent obstructions in your airways during your sleep. This is true among children. Although it is not as common as the causes that have been discussed above. Down’s syndrome, for instance, can cause an enlargement of the tongue and the tonsil. It can also decrease muscle tone. The end result is that there will be obstructions in the airways, making it more difficult to breathe. This is what causes sleep apnea. Another birth defect that can cause sleep apnea is known as Pierre-Robin syndrome. The jaw has a smaller size and the tongue also has an irregular shape.